Kevin Mitnick Security Awareness Training specializes in making sure your employees understand the mechanisms of spam, phishing, spear-phishing, malware and social engineering and can apply this knowledge in their day-to-day job. On-demand, interactive, engaging training with common traps, live Kevin Mitnick demos and new scenario-based Danger Zone exercises. When it comes to rolling out training for your users, KnowBe4’s Automated Training Campaigns do the heavy lifting for you, saving you the hassle associated with setup and chasing down users to complete their training. Apart from the hundreds of easy-to-use existing templates, you can customize scenarios based on personal information, creating targeted spear-phishing campaigns, which replace fields with personalized data. You'll see reporting for phishing campaigns as well as a general overview of your last 5 campaigns, and you can drill-down into one-time and recurring campaigns for more detail. We are so confident our security awareness training program works, we’ll pay your ransom if you get hit with ransomware while you are a customer. 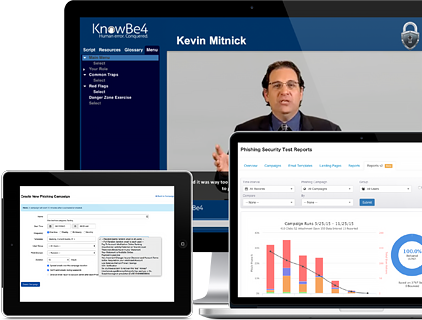 Interested in seeing all the features in Kevin Mitnick Security Awareness Training? More than ever, your users are the weak link in your network security. They need to be trained by an expert like Kevin Mitnick, and after the training stay on their toes, keeping security top of mind. 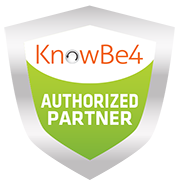 KnowBe4 is the world’s most popular integrated Security Awareness Training and Simulated Phishing platform with over 4,000 customers. Based on Kevin’s 30+ year unique first-hand hacking experience, you now have a platform to better manage the urgent IT security problems of social engineering, spear-phishing and ransomware attacks. 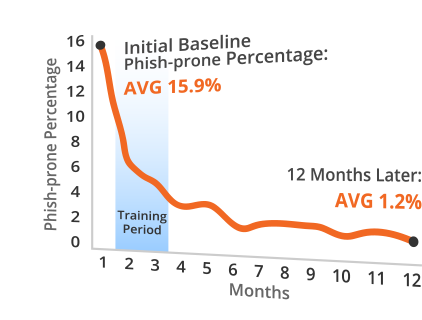 With world-class, user-friendly and effective Security Awareness Training, KnowBe4 gives you self-service enrollment, and both pre-and post-training phishing security tests that show you the percentage of end-users that are Phish-prone. KnowBe4’s highly effective, frequent, random Phishing Security Tests provide several remedial options in case an employee falls for a simulated phishing attack. Find out how thousands of organizations have mobilized their end-users as their first line of defense. You and your team have made my life much better in dealing with employee awareness. It is very appreciated and has given us boost up with our regulatary requirements and preventative measures. I love KnowBe4 and if you ever need a reference, feel free to have people contact me. Get new-school web-based training that addresses the needs of any size organization. Kevin Mitnick Security Awareness Training 2016 specializes in making sure employees understand the mechanisms of spam, phishing, spear-phishing, malware and social engineering; and are able to apply this knowledge in their day-to-day job. You get high quality web-based interactive training combined with common traps, live demonstration videos, short comprehension tests and scenario-based Danger Zone exercises. The 2016 full 45-minute training which is split in 4 modules that an employee can do over time. A 25-minute shorter version which covers the main points of the 45-minute module. An advanced, condensed 15-minute version which specifically focuses on APT and phishing and is now available in 26 languages (including English, French and Mandarin). We also offer additional training modules. You are able to schedule regular Phishing Security Tests (PST for short) from our large library of more than 300 "known-to-work" templates, choose from the community templates section, which were created by admins for admins to share with their peers. You can also create your own custom phishing templates. In case an employee falls for one of these simulated phishing attacks, you have several options for correction, including instant remedial online training. You can schedule one-shot, weekly, bi-weekly or monthly simulated phishing attacks and immediately see which employees fall for these social engineering attacks. Here is some visible proof the training works over a 12-month period. KnowBe4’s Phish Alert add-in for Outlook reinforces your organization’s security culture, users can report suspicious emails with one click. When the user clicks the Phish Alert button on a simulated phishing email it’s reported in the Admin Console. Incident Response gets early phishing alerts from users, creating a network of “sensors”. Your employee gets instant feedback, which reinforces their training. EZXploit™ has patent-pending functionality that allows you to do an internal, fully automated "human pentest" at a fraction of the cost to do this manually. EZXploit takes your simulated phishing attacks to the next level. You can now find out which of your users can actually be exploited by hackers. Using EZXploit, you can launch a simulated phishing attack on (groups of) users that contains a link to a web page – which if clicked on – is recorded as a ‘failure’ in your KnowBe4 admin console, but then takes an extra step and comes up with a secondary ruse like a Java popup that the user is social engineered to click on. If the user clicks on the secondary action, another ‘failure’ is recorded in your admin console and their workstation can be scanned for several things like user name, IP address and other data related to that user's workstation and Active Directory information as specified by you in the admin console. EZXploit gives you a new, automated way to do human pentesting and prevent hackers from owning your network. USB Drive Test™ Allows you to test your user’s reactions to unknown USBs, on average 45% of users will plug in USBs they find! You can download a special, "beaconized" Microsoft Office file from your KnowBe4 admin console onto any USB drive which you can drop at an on-site high traffic area. If an employee picks up the USB drive, plugs it in their workstation, and opens the file, it will "call home" and report the fail. Should a user also enable the macros in the file, then additional data is also tracked and made available in the admin console. 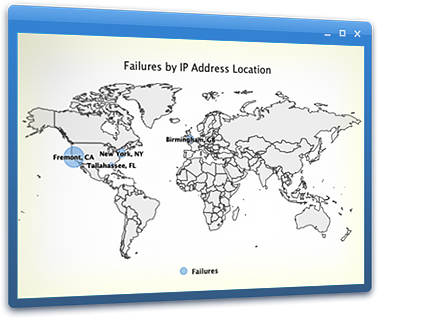 GEO-location See where your simulated phishing attack failures are on a map, with drilldown capability and CSV-export options. Vulnerable Browser Plugin Detection Within your console, you can now automatically detect what vulnerable plugins any clickers on your phishing tests have installed in their browsers. As the Security Awareness Training project leader, KnowBe4’s NEW Active Directory Integration allows you to easily upload user data and saves you time by eliminating the need to manually manage user changes. Once the ADI is configured, users will be added, changed and archived in sync with changes made within AD automatically. You can also upload users with CSV files. 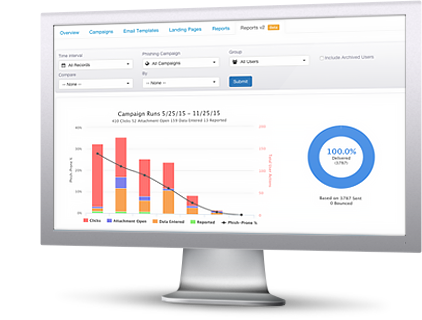 You also get enterprise-strength reporting. Executives get the insight they need to maximize training ROI and track security compliance. The Admin Console provides instant graphs of training effectiveness. This course provides information about Canadian privacy requirements. Why privacy is important for your organization. How to identify and protect personal information. The primary legal requirements when collecting, using and disclosing personal information. How to prevent and respond to privacy breaches. Our organization started experiencing an increase of phishing emails. We were starting to become targets for larger phishing scams, CEO Fraud, etc. Our first step was to audit our IT security, and increase our protection, and while this helped, these types of scam emails were still making past our security. 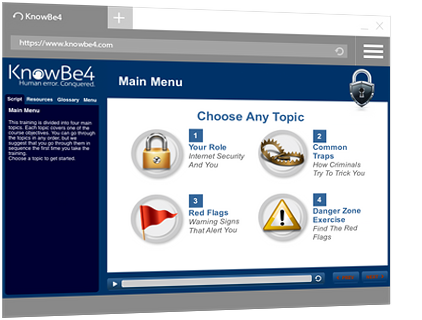 We were then introduced to KnowBe4 as a compliment service to our IT security, to aid in awareness training for our employees. Not only are the email campaigns easy to administer, they are very successful in giving you a view of how vulnerable your users are. Our first phish test resulted in about 20% of our users failing. After 6 months, I am happy to report that with KnowBe4’s extensive products & services (Phish tests, training modules, posters, etc.) that number has fallen to 4%. Our Human Resources department has started to include the training modules as part of their on-boarding process. We are extremely happy with the product and the results! I couldn't be any happier. Thank you. I love your service. If you need an advocate on the west coast, just refer people to me .. I'm so impressed. It's going well. Love the ability to track progress and especially love the "auto-nag" feature so I don't have to remember to send out reminders periodically. This site is maintained by Optrics Engineering, a division of Optrics Inc. Optrics Engineering is an authorized KnowBe4 patner and network-solutions specialist. Optrics Engineering offers full complementary presales support, live product demos and post-sales assistance and training for KnowBe4 Training Products. All Registered Trademarks on this site are the property of the respective owners.